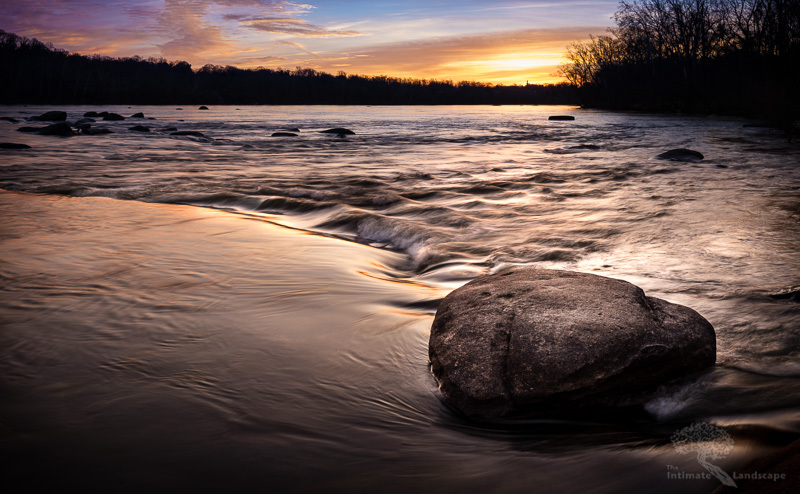 A small boulder sits in the James River at the start of a glorious sunrise. I was recently able to take advantage of a quick trip down to Richmond, Virginia and spent a few minutes at one of my favorite places to shoot: the James River. The image above is one that was more complicated to capture than it had any right to be, if I’m being honest. Equipment issues that I was able to overcome only just before sunrise required me to react quickly to the changing lighting conditions in the scene. To preserve detail in the sky, I had to use 5 stops of graduated neutral density filters: a 3-stop and a 2-stop, both soft edge graduated filters. The image is a collage of 14 images, taken in 2 rows of 7 images each. After shooting the top row, from right to left, I returned the camera to its starting position and lowered the angle to capture the bottom image. I had to adjust the position of the neutral density filters when starting the bottom row to keep the effects of the filters limited to the area of the sky only. The equipment issue came due to the combined use of the neutral density filters and my setup for shooting multi-row panoramas: the Really Right Stuff slider plates that let me adjust the position of the camera and lens to center everything on the nodal point to eliminate parallax came into contact with the Lee Filter holder, which would put just enough tension on the lens to make the Fuji GFX think there was a problem and throw an error message on the screen demanding that I turn the camera off then on again. I was able to barely attach the filter holder to the lens in such a way that prevented the tension, but by the time I worked out the solution, the sun was almost up to the point of being over the trees in the background. I had just enough time to get all the images taken before lens flair started to become a concern. All 14 images were taken at 1/2 second @ f/32, ISO 100 using the Fuji GFX 50S digital camera and the Fuji GF 63mm f/2.8 lens. Adobe Lightroom Classic CC was used to process the images and render the final collage. This entry was posted in James River, Landscape Photography, technique and tagged James River, landscape, Richmond Area, river, Rocks, Sunrise, water.